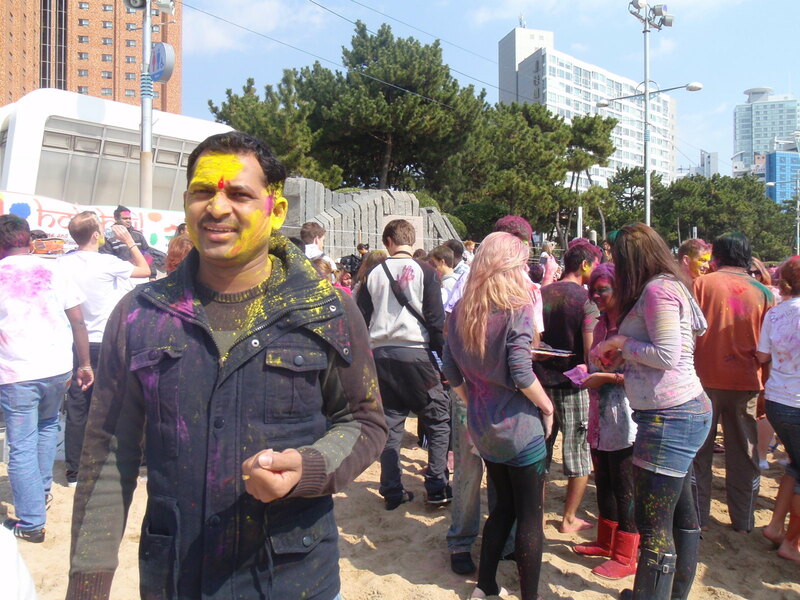 Happy Holi – Indian festival of colour. 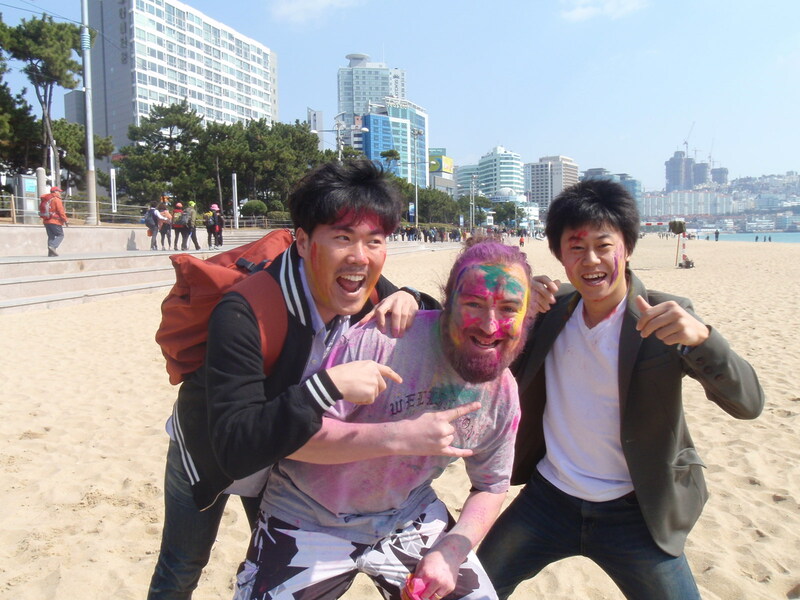 Last week we received an invite from our friend Nikhil to join him and the rest of the Indian community in celebrating Holi down in Busan at Haeundae Beach. Why not?! How often do you get to throw paint at random people? 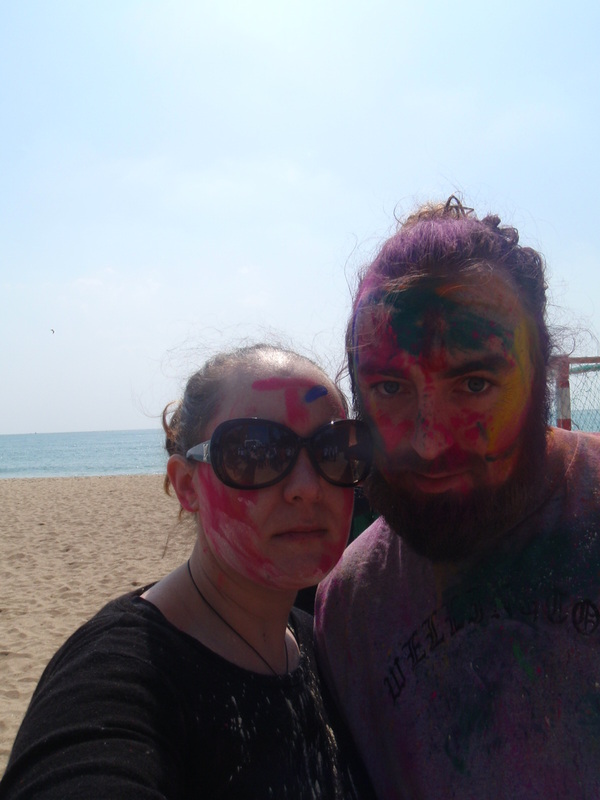 So the two Kiwis packed their bags with their oldest clothes and headed off on the weekend to join an Indian celebration on the beach in South Korea. 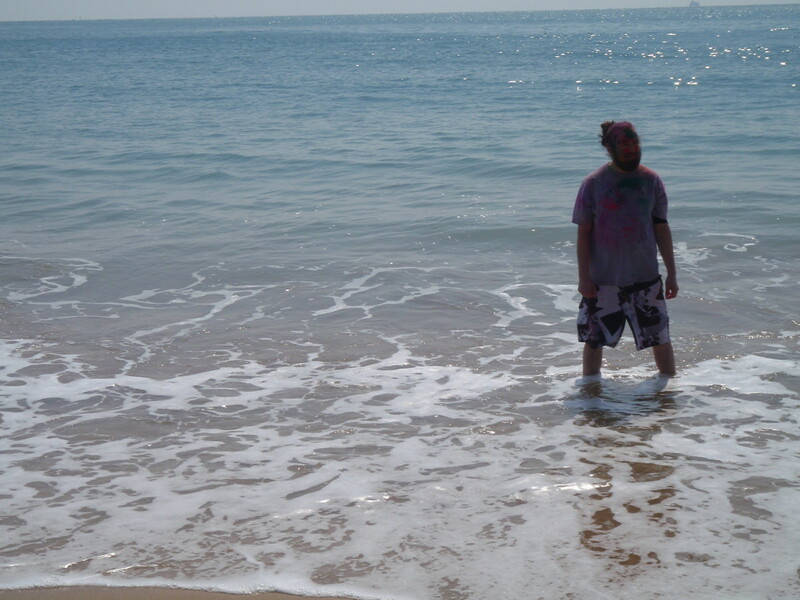 When we got to the beach it was sunny but had a there was a pretty cold breeze cutting through air. Blue skies though and WE WERE AT THE BEACH…spending most of our lives here living in a village beside the largest industrial complex in Korea makes these types of occasions pretty special. Arriving at Haeundae we couldn’t identify quite where we were supposed to be. In the distance we glimpsed what we though might be a crowd so we headed off in that direction…passing on the way one of the coolest sand sculptures we’ve seen! 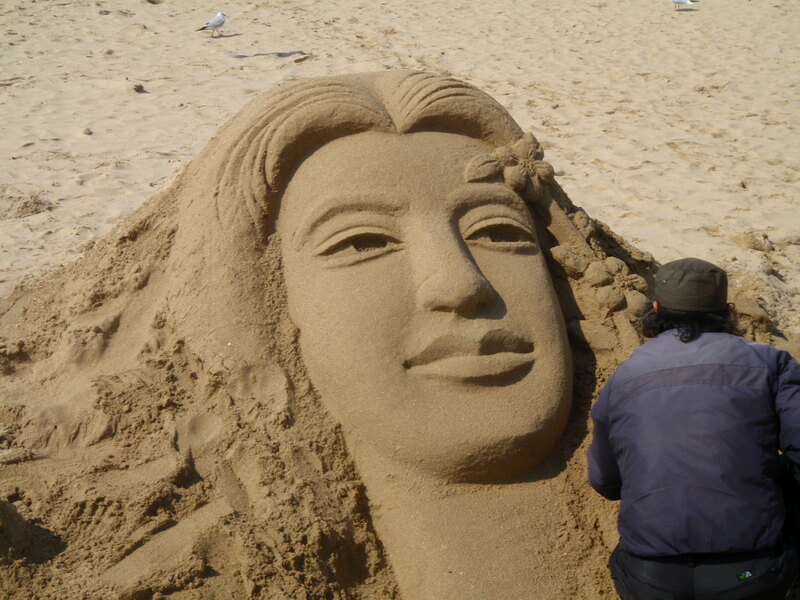 As we continued on down the beach, the sound of Bollywood started to emanate from up ahead. We knew we were on the right track! 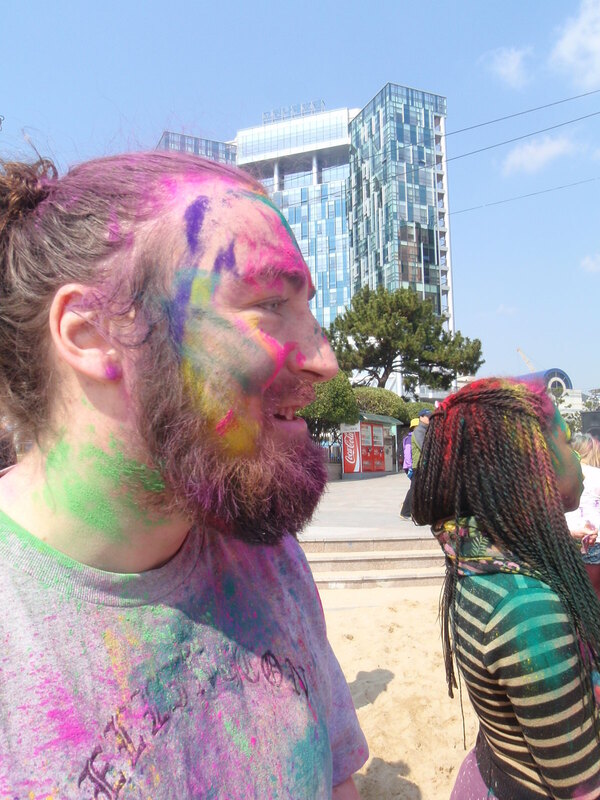 Not much needs to be said really – Holi is a festival of colour which celebrates the end of winter and the incoming spring. 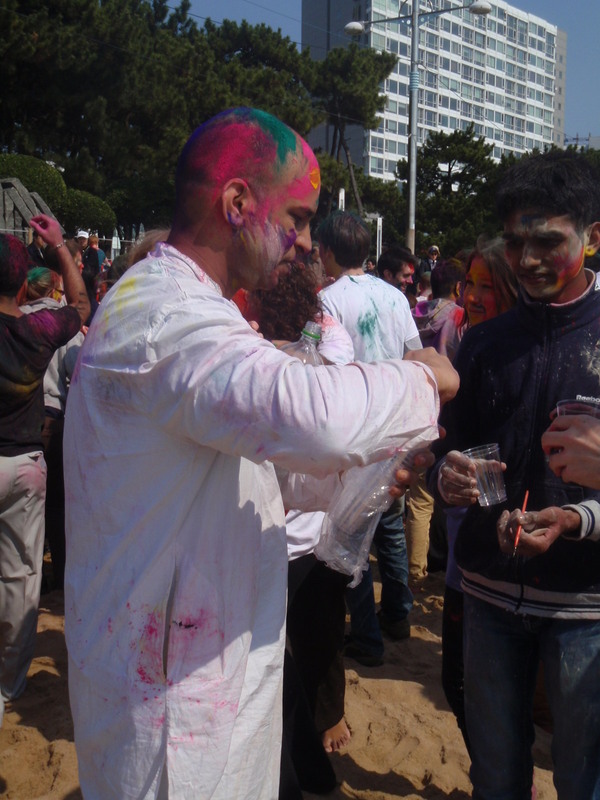 People splatter each other with coloured, perfumed powder and it ends up very messy. 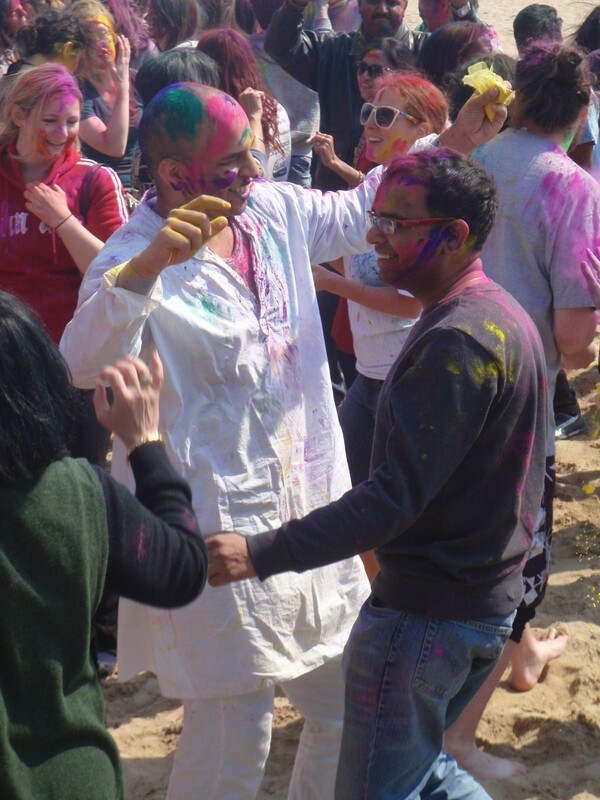 Holi is a celebration for young and old…. The copious amounts of soju being passed around solidified the messiness. 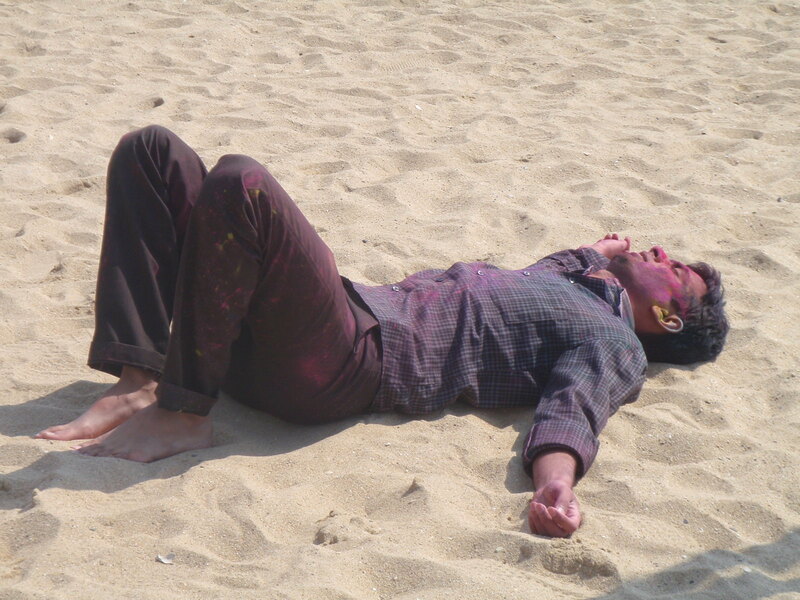 Some even got a little holi-ed out! 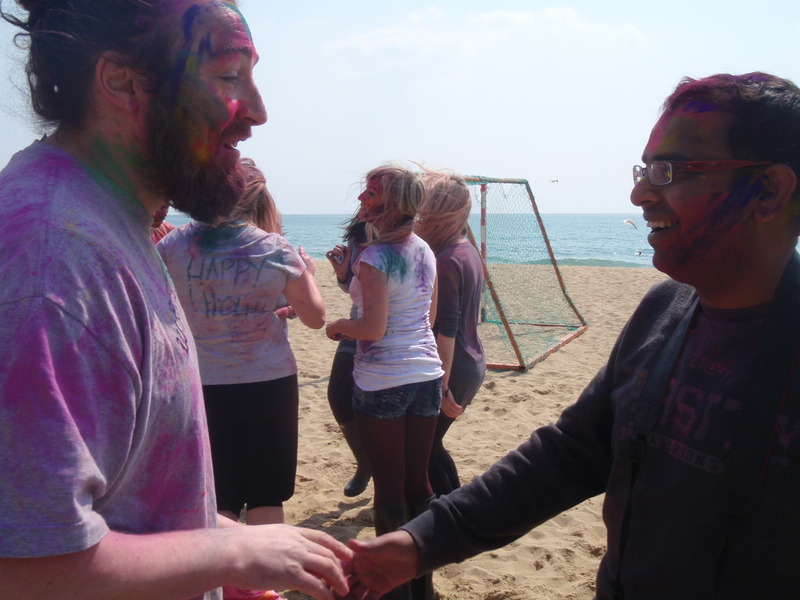 We found Nikhil and started to get our Holi on…. 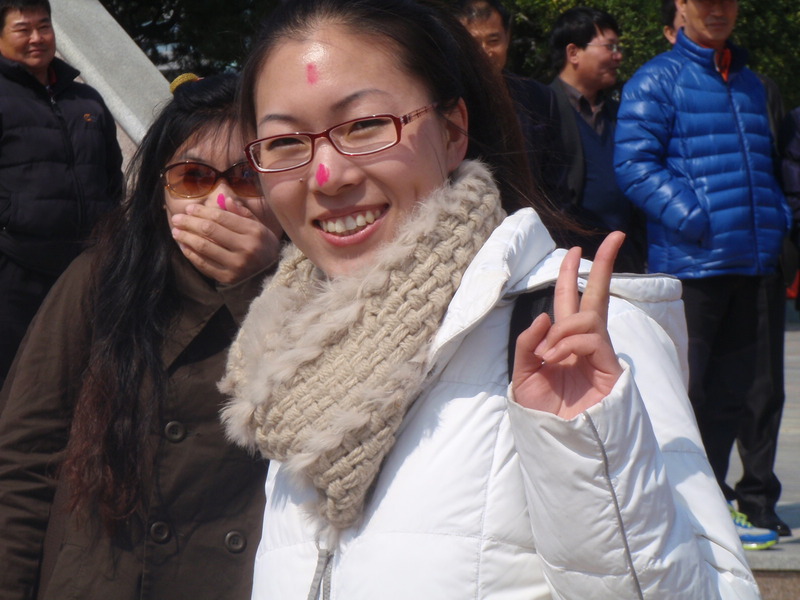 The Korean people strolling down the street thought that this predominantly ex-pat crowd were a bunch of crazies. But Dan convinced a couple of them to get amongst it. 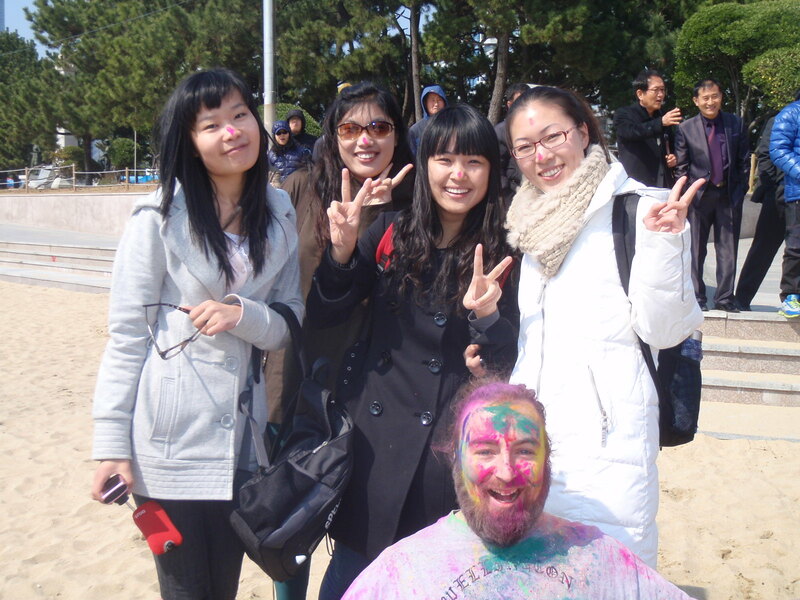 Some of the Koreans we painted got right into the party. 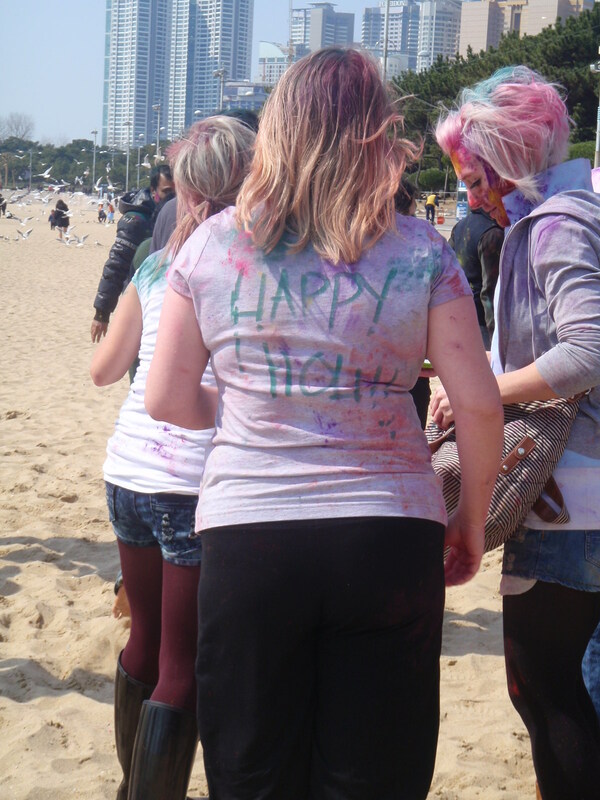 A group of skux teenage boys were loving the paint… as long as they didn’t get it on their clothes. 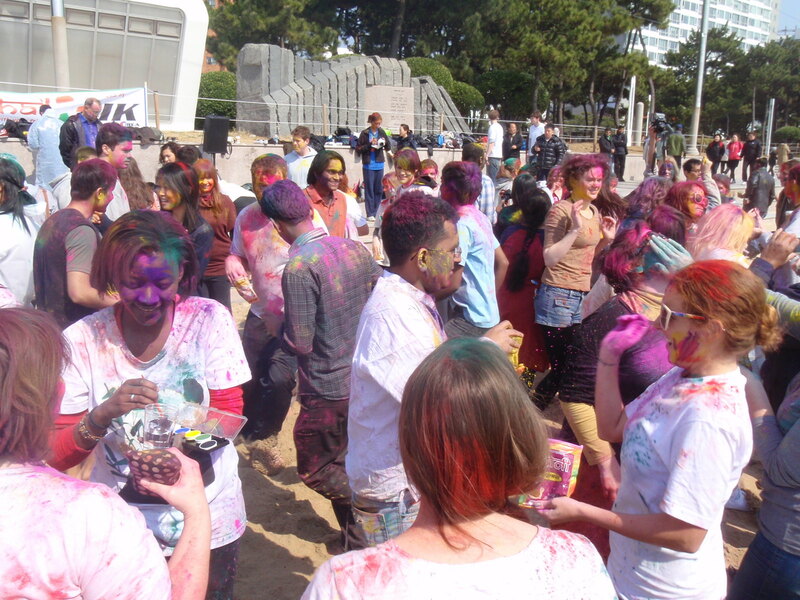 All in all a day of colourful fun and a great excuse to visit the beach. This is so cool! I didn’t know they do things like this in Korea! There is a lot of industry here with heaps of Indians around. Good times and nice to see some cultural diversity round these parts. Looking forward to the next festival to check out. Maybe the cherry blossom festival… they say Korea gets really beautiful at the end of March. 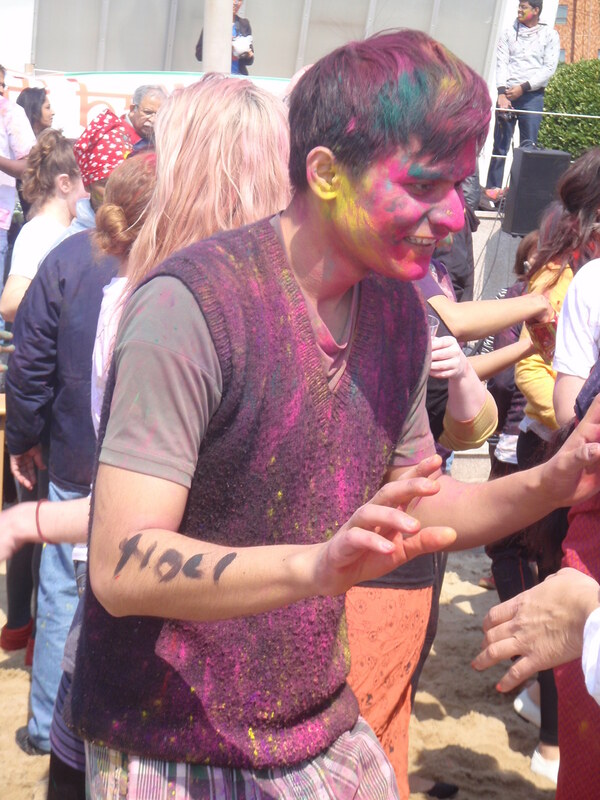 great Indian festival – the Indians seemed to be outnumbered by the others though! This is awesome, go Korea! 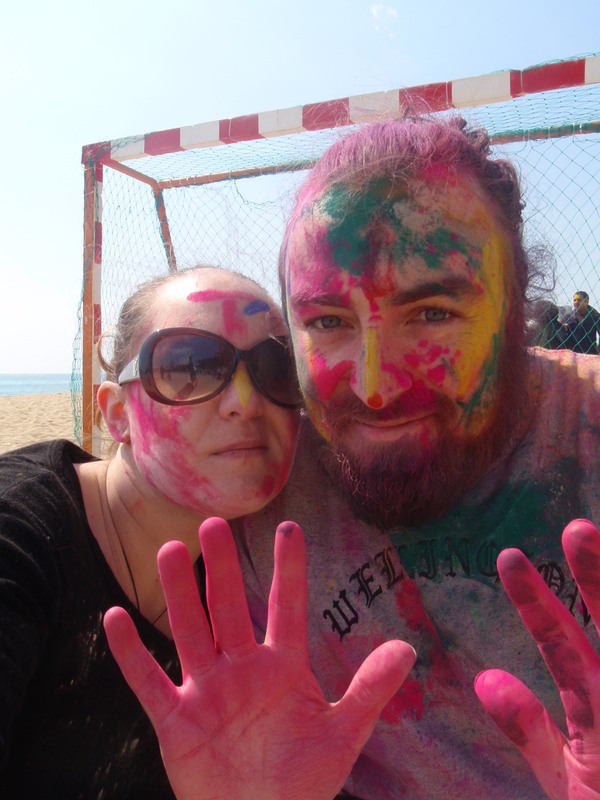 The Holi fest in India is on The List! Wonderful! Looks like a lot of fun! Great post and pictures! I have recently visited India and your post has brought back the wonderful memories I have about this country. Thank you for checking out my blog 🙂 I love and admire what you guys are doing – keep it up! That’s great – India is an amazing country! Are you going to be there for a while? We are going to be in India for about 6 weeks. We can’t wait. 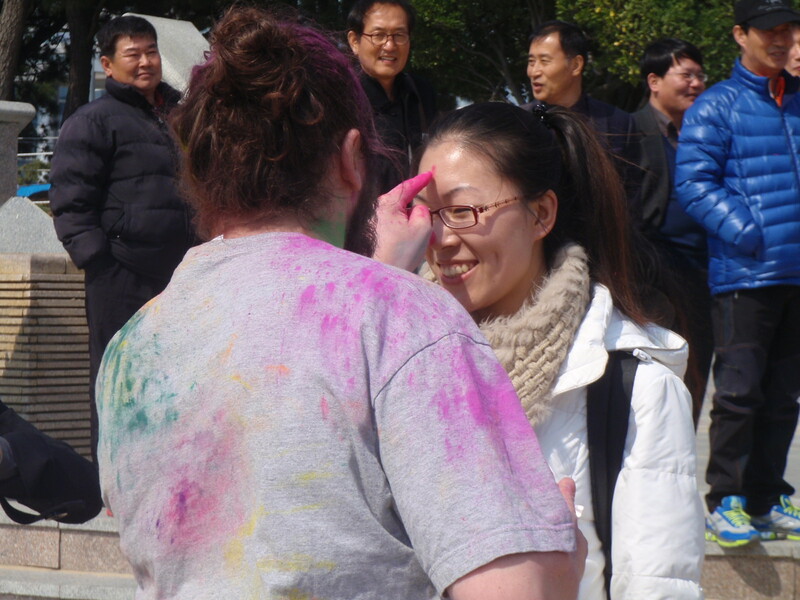 Yes, I was in Katmandu, Nepal for Happy Holi. Totally rad and RED!!!!! 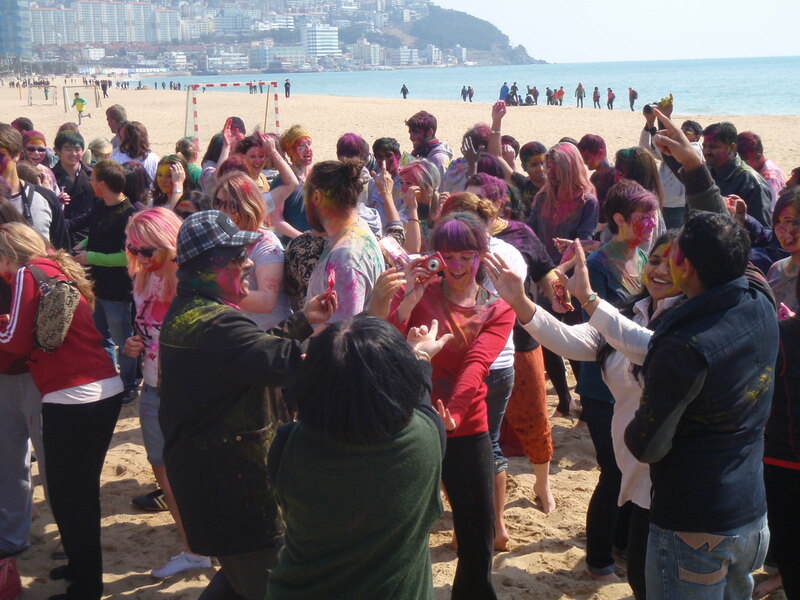 We visited Haeundae Beach last June, and India in January! Thanks for the post. It brought back memories of both! Thanks for visiting our blog! 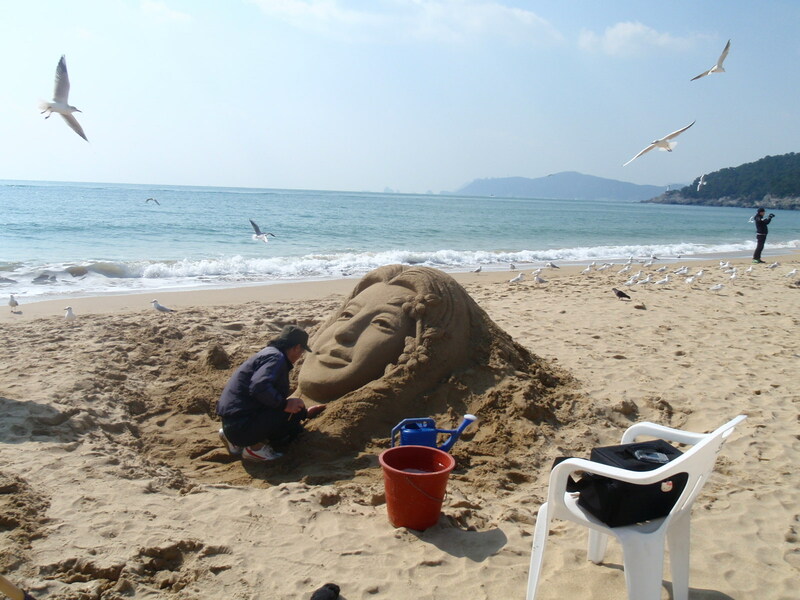 Haeundae is great and always a refreshing change from our little village. We are heading to India in October and are SO excited!!! 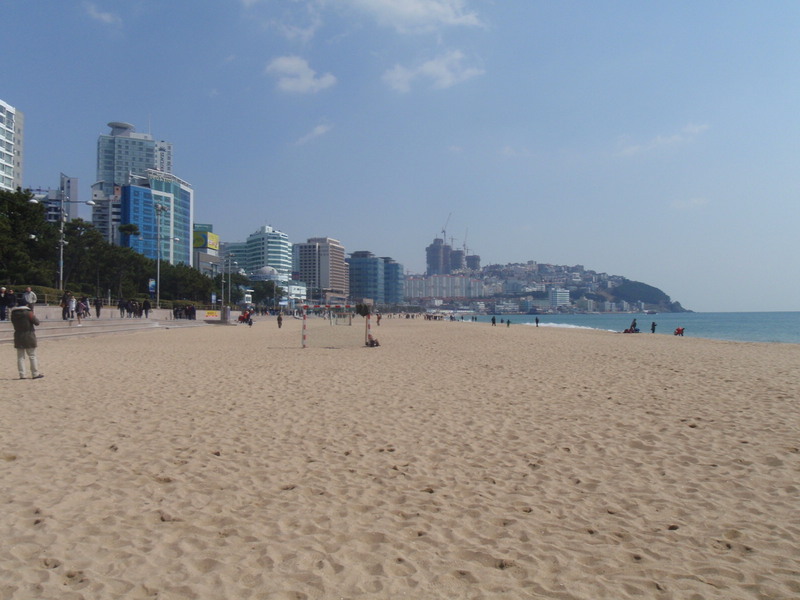 We visited Haeundae Beach last June, and India in January! Your post brought back good memories from both. Thanks! Excellent – the best of both worlds!!! We are heading to India in October so we’re really excited 🙂 Thanks for visiting our blog. It was a pretty fun day – and lovely to be by the sea-side with the weather turning a little more sunny! What a great way to celebrate spring! Very cool though we’d love to experience the real deal in India!!! I just saw a program on Japanese TV the other day, asking people around the world “What color is Spring for you?” Everyone chose one or maybe 2 colors, but the Indian guy chose like 4, and then it went on to show a glimpse of this festival. How cool that you got to experience it for yourselves! 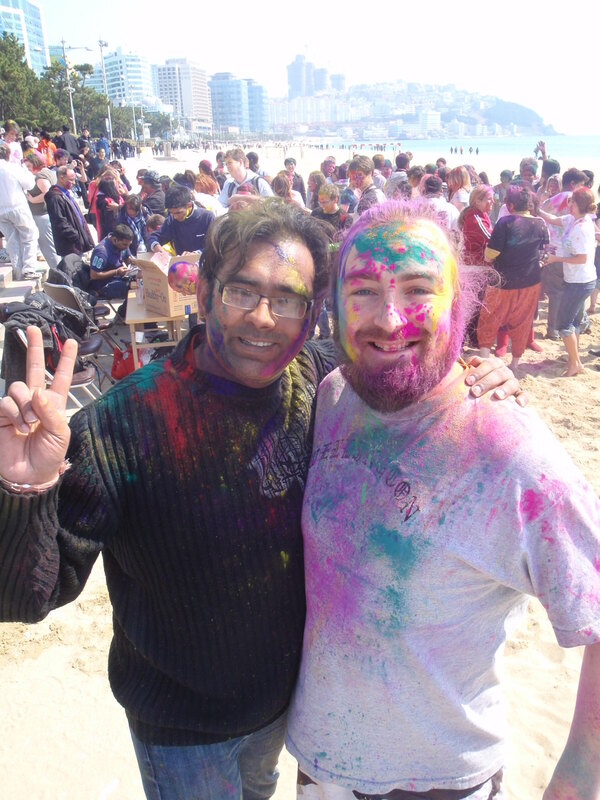 India certainly seems a very colourful place – we’re amped for our trip in October!!! 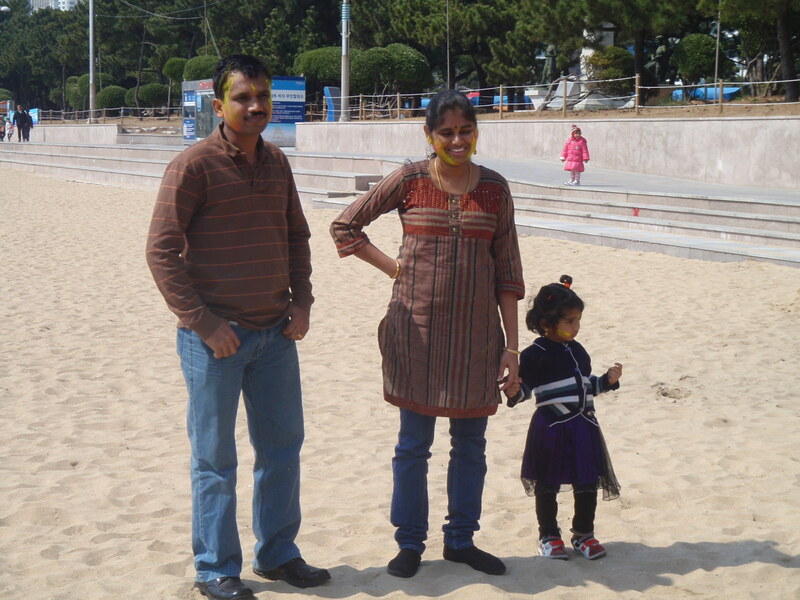 Went to Busan a few summers ago and was surprised to find lots of Indians walking around. So cool that you got to experience Indian festival in South Korea!